As I look around the multipurpose room set for lunch, I notice food from all around the world. Rita Chahal laughs, “We sometimes call our lunch room the United Nations. 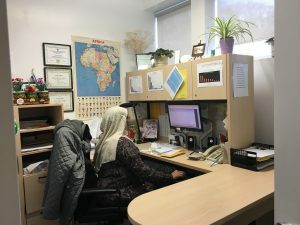 Chahal is the Executive Director of Welcome Place, formally know as Manitoba interfaith Immigration Council, which has provided resettlement assistance to government sponsored refugees and refugee claimants for the last 70 years. “Government sponsored refugees are our bread-and-butter” said Rita. They offer services from the moment they arrive at the airport until they become Canadian citizens. Welcome place is unique, because caseworkers can continue on with the same client from start to finish. Over 90% of the staff at Welcome Place are refugees themselves. This is because language knowledge and cultural competency are their top priorities when hiring said Marta Kalita, the Director of Settlement Services. “We want people who understand what it means to be a refugee” because they understands the resettlement process making them suited to do this work. “They also act as role models” for incoming refugees and gives newcomers hope that they can be as successful. Fetheya Abdela is an example. Fetheya and her family immigrated to Canada as refugees in the late 1980s. Today she works as a settlement councilor and provides services including life lessons– some have never seen a washing machine or microwave before–making sure their children go to school. “It’s really competitive to work here” said Reem Hailemolokot a former refugee from Eritrea and settlement counselor at Welcome Place. “We had over 40 applicants for the receptionist position in just 2 days…everyone wants to work here” said Reem. As I spoke to staff and volunteers alike, all of them shared similar sentiments, that this place and doing this type of work has enriched them. Laura Antymniuk is one of these volunteer staff. As a first year law student at the University of Manitoba, this has been her first clinical experience working with clients. There are about 20 law students volunteering with Welcome Place. They receive credit for the work and Antymniuk feels it has been an answer to her anxiety and stress. In the grand scheme of things, “When you hear their stories…it helps you situate your experiences” it also has “made me more politically aware about what’s going on around the world as well as Canadian politics at home”. Fetheya Abdela a Settlement Counselor at Welcome Place, working in her office.